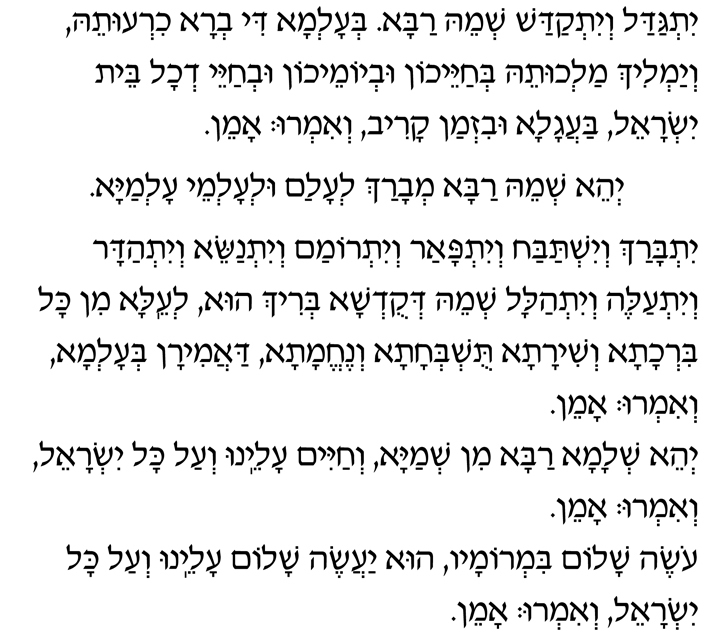 Version of the Kaddish, praising God, that mourners recite during the bereavement period and to mark the anniversary of a death of a loved one. Download the printable version of the Kaddish. Yitbarach v’yishtabach v’yitpaar v’yitromam v’yitnasei, v’yit’hadar v’yitaleh v’yit’halal sh’mei d’Kud’sha B’rich Hu, l’eila min kol birchata v’shirata, tushb’chata v’nechemata, daamiran b’alma. V’imru: Amen. and the life of all Israel — speedily, imminently, to which we say: Amen. praise, and comfort. To which we say: Amen. May there be abundant peace from heaven, and life, for us and all Israel.